If you are a Champagne lover, what’s your best way to spend a good Saturday afternoon? 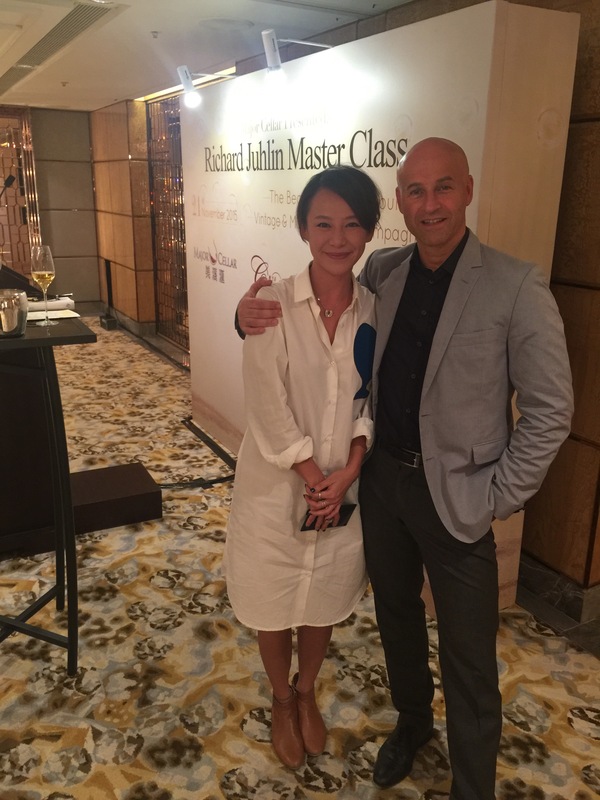 For me and one of my champagne maniac buddy, it was attending Richard Juhlin’s “Vintage and Maturation of Champagne” tasting at the Ritz Carlton in HK. It wasn’t hosted at a huge venue; roughly about 30 people attending the class, pretty causal overall, while I spotted a guy looking pretty handsome in tux to show respect. 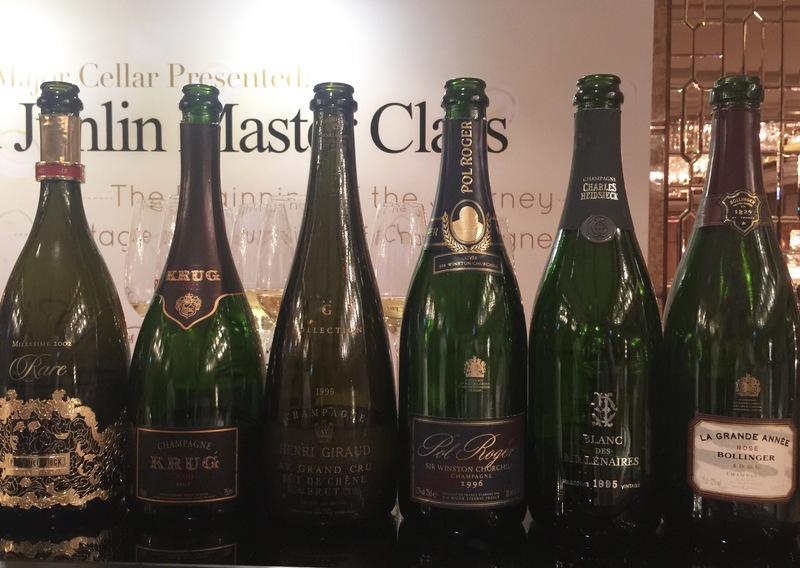 We had tasted 6 champagne from 6 different houses and 6 different vintages from 1995 to 2002. 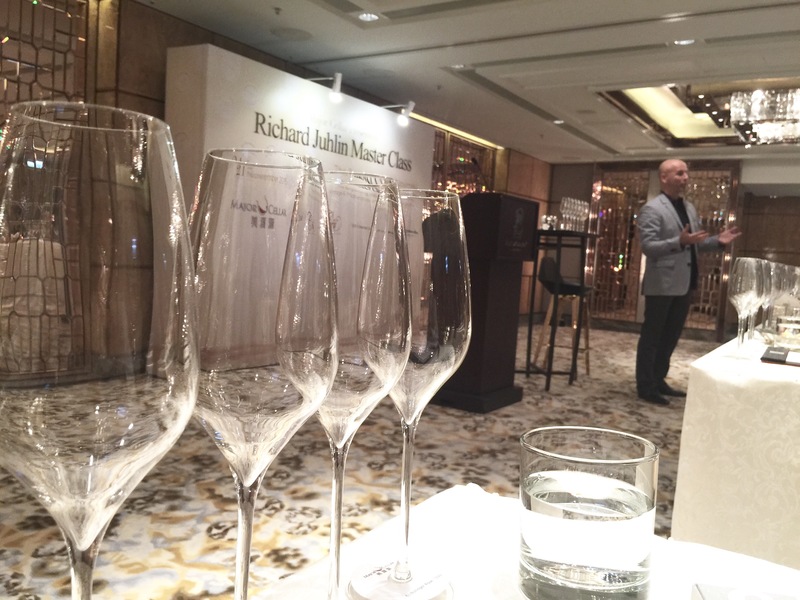 Richard talked about the basic on what he believes to be the best way of tasting champagne – “concentration” i.e. 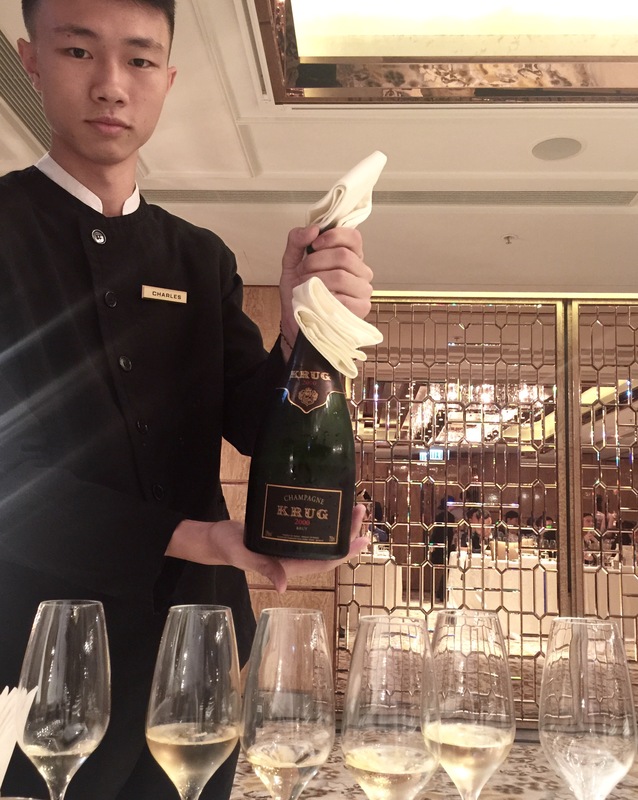 you need to focus on the smell and taste of champagne even if you may be in the club celebrating; he talked about the best level of pour in a champagne glass ; the best temperature serving the bubbles; and his books of course. Fresh toasty, bready aromas on first nose. There comes fresh white peach, citrus and pear notes onwards. Very well balanced with richness and focus. Great texture and refined mouse. love how lively, long and fresh this wine is. Can starts to drink now but certainly can wait for another 10 years. This golden champagne is too delicious with great fragrant of smoke, peach, pear, chamomile, honey and coffee. The rich expansive broad flavors ranges from peach, almond, mandarin zest to ginger, a surely dryer one compare to the Piper rare 2002 tasted earlier. The fine, creamy mousse with now integrated acidity comes with much finesse with good power and complexity. Long salty finish, hard to imagine anyone can resist a 2nd sip. lovely and can live a long life like most Krug do. The 70% Pinot golden orange champagne is less impressive than the usual past Fût de Chêne I had tasted. nose of red apples, pear, nuts and petals in cream form. great concentrations yet quite heavy in style with pink grapefruits, pear, ginger, oak and spices a medium dropping finish. I wonder if this is due to bottle variations….. This 96 Winston Churchill is so alive with class and power. bright golden lemon color with great nose of green apple, lots of flowers, orange, brioche, nutty but fresh. Creamy palate of tropical fruits, ginger, ripe pears and flinty, great acidity, young and classy! love it. impressive freshness of green apple honey and lemon tart. vibrant acidity along with good concentration and persistence of flavors. So rich and intense, very youthful which one can’t imagine, a long persistence finish on the sweet end. Yeasty, brioche, hazel nuts, strawberries, blueberries and smokey fragrance. Vigorous, big and vibrant. This Bond wine may be even better if it was less pushy. Best to pair with food. Golden lemon tone. It has a pronnoused yeasty brioche nutty note to it. This Fût de Chêne 2000 is certainly a rich and creamy one with a broad palete ranging from ripe apple, lemon, flowers, peach to smoke, very delicious in a special way yet acidity can be fresher to be sublime. Buttery seashell salty aroma this magnum of 1997 Fleury possessed. Quite vegetal in style. Lots of grassy, citrus, green apple note with a medium finish. I believe this wine has to be drunk now. This Champagne is a blend of Chardonnay, Arbanne, Petit Meslier, Pinot Blanc, Pinot Noir and Pinot Meaner grapes and for this reason is being named as 6 cepages. I found the nose is quite pure and soft with white flowers, ginger, citrus and honey. On palate this is one of the few I like most (out of the few we tasted on the side), it is round and fresh with both white & pink grapefruits, apples. Great freshness and balance, a very good long finish. Moutard is always underrated for some unknown reasons, yet, it is such a good champagne amongst all. Richard Juhlin, born 1962, is a Swedish Champagne writer, who has written a number of books that have been translated into several languages, including English and French. Juhlin is a physical education teacher by training, and was educated at Gymnastik- och idrottshögskolan in Stockholm. He worked as a teacher in Mälarhöjdenbefore he could make Champagne-related activities his full-time profession. As of 2008, the total number of Champagnes tasted and rated by him was 6,500. In 2002, he was given the French award Mérite agricole of the rank Chevalier. And in 2003 he pointed out 43 out of 50 champagnes in Paris at the annual Spectacle du Monde tasting.